How to Get Rid of Deer in the Garden - A deer is a beautiful and elusive creature, but they can destroy a garden. If you are trying to humanely get rid of deer that are in your garden there are a few things that you are able to do. One method that is commonly used is to sprinkle dog hair around your garden. While deer will never get close to the dog hair to inhale it, they are able to smell the odor it emits. The odor of the dog hair will usually prevent them from coming into the garden. A more common and obvious solution to deer in your garden is by erecting a fence. If you choose to build a fence around your garden, you need to make sure that it is at least 48 inches in height. Anything shorter than that, a deer will be able to easily jump over it. Deer are also able to break through wooden fences as they are incredibly strong, and you want to be careful that you do not use a wire fence that a deer can become stuck in. How to Get Rid of Deer on the Porch - Normally, deer will tend to stay in the woods or only venture into your garden. However, how do you get rid of the brave deer that has ventured onto your porch? There are various eco-friendly methods that you are able to utilize to keep deer off of your porch. One of the easiest ways to get rid of deer from your porch is by surrounding your porch with deer repellent. There are numerous natural forms of deer repellent found at local sporting retailers. You are also able to sprinkle a few drops of coyote or fox urine around your porch or deck to cause the deer to go running. Once you have rid your porch of the deer, you will want to make sure that it does not return. There are several different shrub species that you are able to plant around the stairs to your porch that will deter the deer. Some of these plants are Meadow Sage, Thyme, Lavender, Daffodils and Cactus. Not only will you be improving your landscaping, you will be helping to get rid of deer. How to Get Rid of Deer in the Yard - Whitetail deer are beautiful animals, but they can cause a lot of damage to the trees in your yard. There are many ways to deter deer from damaging the bark off of your trees. There are the usual methods of shooting the deer during hunting season, but you need to check with your local laws and review any regulations they may have. A more humane way to keep deer away from your trees is by causing something to touch their legs. This is something that really bothers a deer. You can install a piece of fishing line or thin wire at least eight to ten inches above the ground around the tree. When the deer approaches, their legs will hit the wire and cause them to go elsewhere. Another popular method is using scented soap. This is especially beneficial if you have a fruit tree. Simply, drill a hole into the center of an unwrapped scented bar of soap. Hang the soap from the lowest branch of the tree with fishing line. This will usually keep the deer from approaching the tree. How to Get Rid of Deer from the Outside in the Landscaping - There are many animals that homeowners fear about getting into their home. However, there are some animals that people prefer not to have outside their home either. There are many ways homeowners are able to get rid of deer that is outside their home. Most deer will roam into your yard to eat off of your shrubs and trees. 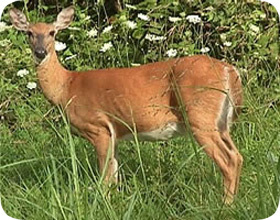 One method for getting rid of the deer from outside your home is by mixing water with tobacco sauce in a spray bottle. You are able to spray your mixture on tree bark, plants and flowers that the deer may eat. This will usually deter them from coming back for a second helping. Another humane method is to install a sprinkle. Deer are not fans of getting wetting. Place a sprinkler system on a motion sensor. When the deer trips the motion sensor, the sprinkle will turn on, getting the deer wet. This will usually cause the deer to flee back into the woods. Go back to the main Deer Removal page for more information about how to get rid of fox yourself. How to Get Rid of Deer Outside - Deer are everywhere and they are much more densely populated than they were a decade ago. Even urban homes will see the occasional deer in their yard. There is no way to eliminate the deer around your home. You are not allowed to trap deer and hunting season is only once a year. The best you can hope to do is manage the deer outside of your home. Deer control starts with excluding the animals in any way you can. If you can afford to have a perimeter fence installed around your property—you should. Fences are one of the most effective means of deer control. Beyond that you will need to cover up your perennial plants with sacks or wire mesh and keep your decorative trees pruned back so the deer can’t reach them. Deer are easily frightened, so a free range dog will be a huge asset to you if you need to keep the nuisance grazers away.